After my Homemade Pumpkin Puree post, I realized I'm in my domestic goddess mode, yet again! I have made a fresh batch of Marinara. And I made a Sid's favorite candy. At home. From scratch. The post will be up soon. So I'll let you keep guessing. Also I made a fresh batch of Bhaja Moshla (Masala) - Roasted Spice Blend. Actually Bhaja Moshla (Masala) has nothing to do with my domestic goddess phase. I have to make it at home, because it isn't available in stores! Bhaja Moshla (Masala) - Roasted Spice Blend is a combination of spices that are dry roasted on stove top, very low and slow, till you are hit with a heady aroma, then cooled and dry grinded and stored in air tight containers for later use. There are many variation of Bhaja Moshla (Masala). 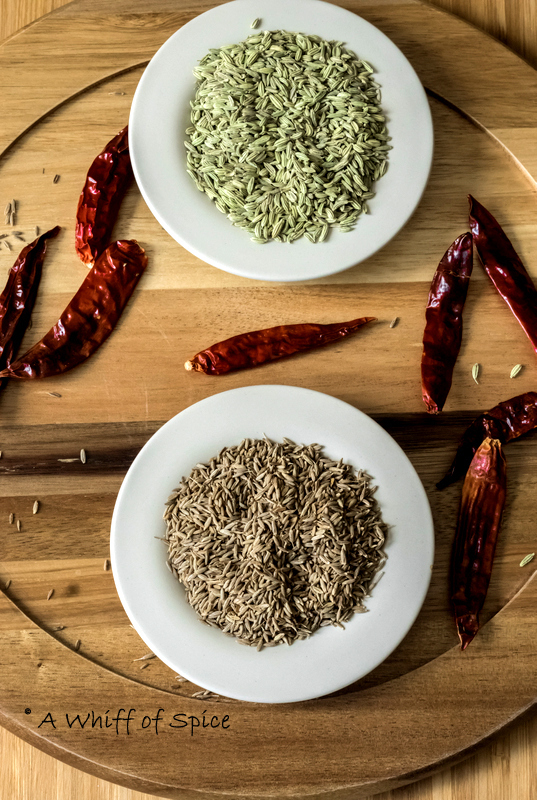 The one that I most commonly make is a simple a combination of cumin seeds, fennel seeds and dry red chilies. I first mentioned about it in my Ghugni post. The one I did almost 4 years ago. I was recently going through my Ghugni post again and noticed how my writing style has changed over the years. And so has my photography skills. I am still not even close to the amazing food photographers out there. But I'm trying. The one person who had been the most instrumental in improving my photography skills is Sarani, aka the Cocowind. We have known each other for almost 20 years now. To every other person, she is an elegant, soft spoken, kind hearted lady. And she really is. 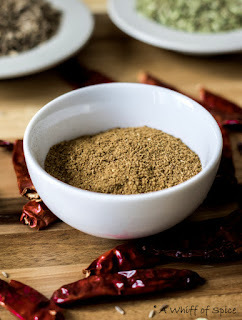 This Bhaja Moshla (Masala) - Roasted Spice Blend post is dedicated to her. Just the way my Bhaja Moshla took her sublime Mangshor Ghugni up a notch, her presence in my life, enriches me and makes me strive to be a better individual! 1. In small pan, dry roast the cumin seeds, fennel seeds and the broken dry chilies, on low heat till aromatic, and slightly golden. 3. Grind to a semi fine powder using a spice grinder or coffee bean grinder. 4. Store in a clean, airtight glass jar. 1. 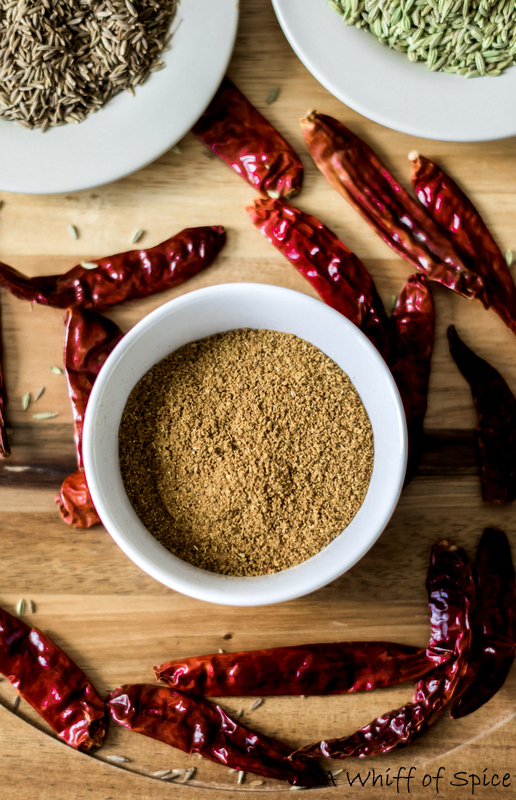 Initially i used to make a really big batch of this roasted spice blend, using about 1/4 cup each of cumin and fennel seeds. But over time, it looses some of its aroma and flavor. It is better to make it in small batches. However, you can still double or halve the recipe.